Lots more of your beautiful cats have been submitted to our cat photo gallery to see more visit the cat gallery . Enjoy. 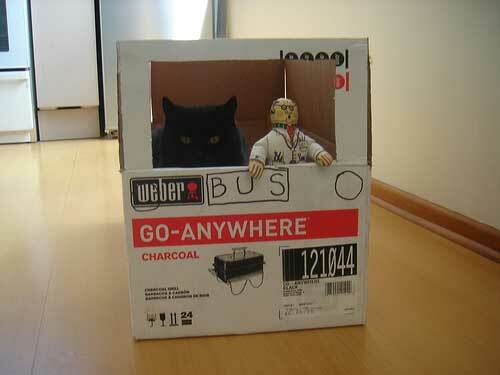 Don't forget to submit your cat to the cat gallery so that others can enjoy your cat as well. Here is the new Caption Competition. All you have to do is write a caption for this picture. . The deadline for this competition is July 25th. The best caption will be chosen and the winners name and caption will be posted on the www.our-happy-cat.com competition page. by Liz Ross and Lynn Chang. 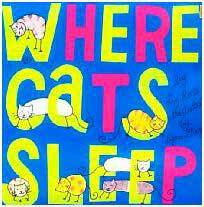 A lovely little book of sweet illustrations showing all the wonderful places cats choose to sleep. 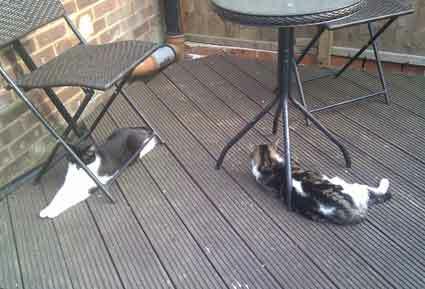 Now our cats can happily sit in the garden without fear of attack. It's amazing the effect one cat can have on a neighbourhood. we haven't heard any cat fights for weeks now and our two cats are so much happier. I am a pretty handsome Tuxedo male cat about 2 years old. My story is one of TRUE RESCUE and the heroic measures that some people take to save us Homeless or Special Needs kitty's. I was born in a Feral Colony close to a large Car Dealership in Florida in 2009. Most of the cats in my colony didnt like humans and stayed away from them. I was different. I was curious about humans and I desired to be petted and LOVED by one of them. I seen alot of people coming and going daily at the Car Dealership and I decided to venture closer and have a look at these humans. A nice lady that worked at the dealership seen me and tried to win my trust. I was scared and reluctant to allow her close to me but she looked so kind that I gave it a chance. Her name was Diana and she was very nice to me. She petted my weary head and made sure there was yummy food left for me to eat. This went on for my first year of life. Kitten feeding a new born, who has unfortunately either lost his mother or has been abandoned, is not that difficult but it does take a little extra care and knowledge (see previous page about what to feed a new born kitten). 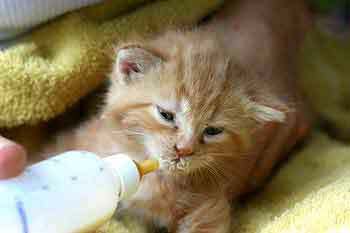 The following advice and video will demonstrate how to hold your kitten, hold the bottle feeder and also how to help your kitten eliminate for themselves afterwards. Kitten feeding can be fun too for both you and the kitten, you will see in the video how the kitten becomes excited when you begin to feed. This can cause problems at first as they may begin to suckle excitedly but not actually be getting any milk. So it is important that you take note of how much is in the bottle feeder to begin with so that you can see how much milk they are getting. It is important to feed your kittens correctly as not doing it correctly can harm them. The main concern is Pneumonia caused when fluid enters the lungs. Warm the bottle with the formula by placing in a cup of hot water for a few minutes. Hold the kitten so they are on their fronts and so have to extend their heads to get the milk. This is the natural position.